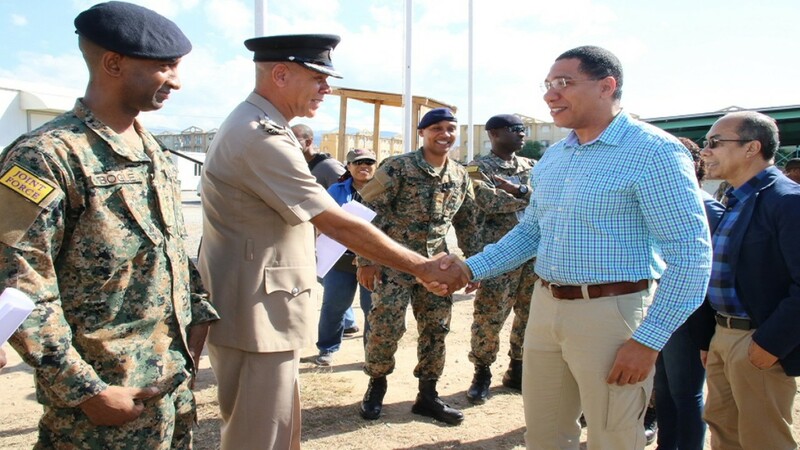 Prime Minister Andrew Holness (second right) greets police commissioner Major General Antony Anderson (second left) during a recent tour of a detention centre. Prime Minister Andrew Holness has announced that he will be declaring additional Zones of Special Operation (ZOSOs) before the end of March. Holness made the announcement on Tuesday while speaking in the House of Representatives where two motions to extend the Denham Town, West Kingston ZOSO as well as the ZOSO in Mount Salem, St James, were debated and approved for another 60 days. Having previously said up to 20 communities across the island met the criteria for a ZOSO, the prime minister said funds have been set aside in the budget for the 2019/2020 fiscal year, which should be debated and approved before the end of March. This will allow for more ZOSOs to be declared. “In fact, you are likely to see a zone declared even before the end of March, in anticipation of the resources allocated in the budget,” Holness stated. In the meantime, he said $184 million for infrastructure improvement projects for Denham Town was launched on January 31. In the case of Mount Salem, Holness told the House that there has not been a single murder in the once violence-prone community since the ZOSO was introduced in 2017. He said he ‘believes’ there has only been one murder in Denham Town since a zone was declared there. “Mr Speaker, by all measure they have been effective,” he said. According to Holness, the country was now aware that these crime fighting measures are long-term in nature. “They are not just designed to have a reduction in crime for 60 days. The intention is that these communities will develop the leadership. They will develop the institutions and the general environment of peace (so) that infrastructure and other kinds of development will be brought to these communities,” he said. The prime minister told the House that the ZOSOs were now at the stage where the focus was on the development of the leadership structures in both communities. This includes the organisation of citizens’ groups, parenting and educational activities and the management of conflict resolution. There is also focus on economic empowerment whereby residents are being assisted with grants and small loans “to ensure that micro businesses can start to flourish,” said Holness. In the case of Mount Salem, the issue of regularisation of settlement is being given attention. To this end, work has already started on titling. The prime minister also told the House that the government has received support from the European Union. He said some of the money will be spent on intervention measures inside the ZOSOs. He said the country’s development partners were taking an interest in the ZOSOs “because the challenge of violence in communities is not just a Jamaican occurrence, it is happening right across the Caribbean and in the wider Latin American region.